The British hadn’t forgotten about the French, and Admiral Horatio Nelson was sailing all over the Mediterranean looking for the French army. The British under Nelson eventually found them docked at Aboukir Bay, hoping to use the shoals of the bay as defense against the powerful British Navy. Admiral Nelson chose to attack the French at night, using lanterns to know where each ship was. The British would lose many ships in the attack but were able to exploit a gap in the French ships and would eventually win due, in large part, to better positioning. 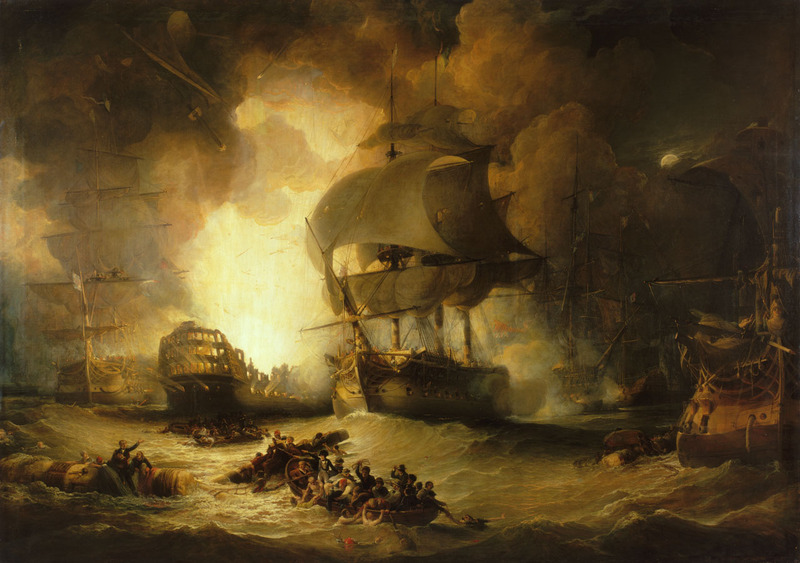 This battle, which would become known as the Battle of the Nile (or the Battle of Aboukir Bay)(1798), would end when the British hit the ammo deck of “the Orient.” This ship was the largest ever built and when it exploded it would kill over 1,000 people and a number of ships surrounding it. The entire war would stop while both sides put fires out, and then resumed when the remaining French ships attempted to flee. The few French ships that were left tried to escape the battle, only to be destroyed easily by the British. to stop this, he would cut the tongue out of any Egyptian who spoke of this battle, which didn’t make the people any happier with him. This would become known as the most decisive naval victory of all time, and created a belief that the British navy was, by far, the best in the world. The British would hail Admiral Nelson as a hero and make monuments for the battle, the most well known being Cleopatra’s Needle in London. Lastly, this would give the allies enough encouragement that it would start a new coalition against the French. The French were now stuck in Egypt without supplies or reinforcements because of the loss at the Battle of the Nile. Since he had no hope of being reinforced and many of his men were sick with disease, he chose to make an army from young slaves in Egypt (16-24). He saw this as the only way to hold out against a population that was starting to rebel against him more often. He also made a curfew for the people of Egypt in an attempt to quiet all the chatter about revolts against him. He continued to claim that he was there to help liberate the people though, and would double down on his talk about how great Islam is. Even though he had no real interest in religion, he often used it as a political tool to get what he wanted, so he started to tell the people of Egypt that he wanted to teach Islam to Europeans. He created a parade in Egypt for Muhammad’s birthday and went out of his way to protect anyone trying to go on their Hajj. The Egyptians continued to see through this propaganda though, and no matter how long he talked about it no one really believed it. While Napoleon was blustering about his friendship the people of Cairo were slowly planning a revolt. Religious leaders started spreading weapons in the streets, swearing to exterminate all French (1798). These leaders claimed that the French were atheists, which was a common comment about the French at this time, and should be killed no matter what. When the attacks started the French would set up cannons in the Citadel and started to fire at the people. The outgunned Egyptians would run to the Great Mosque for protection and the French would surround it. The French opened fire on the mosque with cannons and would massacre anyone who had taken part in the revolt. Whether justified or not, there was no way to make people believe that the French were pro-Islam after this and Napoleon started to realize that he was in more trouble there.